ROI or Return On Investment is a way to gauge the productivity or profit/loss from money spent on an investment. In business, companies will use this information to determine if a project or investment is worth the risk, ultimately leading to a net profit gain as the end result. In my own personal experience, my wife and I were considering buying into a timeshare vacation property a few years ago. To enter into the agreement, the company required a $ 22,000 “buy-in” (financed of course) and a recurring cost of approximately $60/month for the next 22 years. This would have afforded us 124 “points” for nightly stays on our planned vacation. Their timeshare rentals are tiered into different room types – Studio, 1 bedroom, 2 bedroom or a 3 bedroom villas – with each room type costing a certain amount of points. For us to maximize the length of our stay, we would have to select the studio room which would have given 6 nights at a total of the 124 points. We have visited this popular vacation destination several times so we know what the average cost is to spend a week on property and purchase theme park tickets for our stay. When we booked on our own, we spent on average a little less than $ 3,000 for 7 days which included our room each night and 6 day park passes per person. The timeshare rental cost was just for the nightly stay, it didn’t include any park tickets, food or other recreations. On average, the cost for 6 days worth of park passes per adult is close to $ 450.00 and per child it was around $ 400.00. Considering there are 2 adults and 1 child (at the time) we had to pay an additional cost of $ 1,300.00. So if we joined the timeshare and stayed for 1 week once a year, it was going to cost us approximately $ 3,020.00 ($ 1,720.00 (timeshare cost) + $ 1,300.00 in tickets). In this case, it was actually going to cost us MORE in the long run than if we booked a yearly vacation on our own (< $3,000), leading to a negative ROI. (not to mention, I really didn’t want to commit to the same vacation for the next 22 years!). When discussing replacement compressed air blowoff solutions with a customer, many times they look at the purchase price of the device and question if it’s worth it for them to make a change. If you follow along with our blog, you will notice that over the last few months we have submitted several different entries relating to this topic, like replacing drilled pipe with our 12″ Super Air Knife resulting in a 47 day ROI or where a customer replaced 4 open copper tubes with our 1110SS Nano Super Air Nozzle and recurring their expenses in just 38 days. In these instances, we show the calculations in regards to the true cost of ownership and how quickly you can recover capital funds when considering the whole scope of the project. 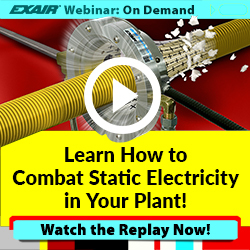 At EXAIR, we are committed to providing Intelligent Compressed Air® Products that reduce compressed air consumption leading to a more efficient process, as well as increasing operator safety. If you are considering an EXAIR solution for your current process but have questions about price or performance, contact one of our application engineers for assistance. The process of making cocoa powder and chocolate products is fascinating to say the least. The video above shows the process at the Hershey factory in a throwback “How Its Made” video from the 70’s. (I think; based on the hairstyles. Also based on the video description, but mostly based on the hairstyles.) It’s interesting to see the process and the mechanical aptitude it took to create the machines, especially with the weights and measures. The level of complexity and number of steps involved can make you wonder how we ever figured it all out, but thankfully we did! Current cocoa production follows the same basic process through harvesting, roasting, extracting cocoa butter, and grinding of cocoa cakes into powder. And, like any manufacturing process, there are sure to be applications which demand unique solutions. 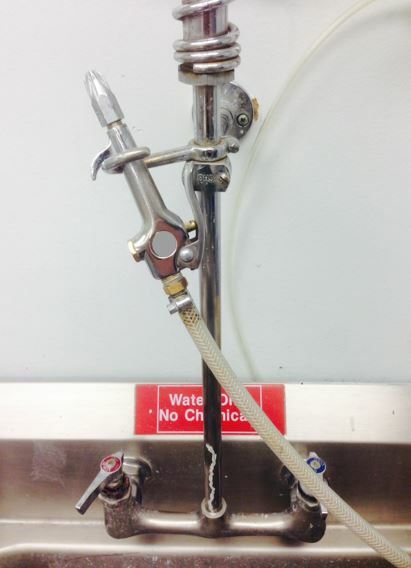 This is where a recent application took place for an EXAIR end user. Not shown in the video above is a cooling process for the cocoa powder. 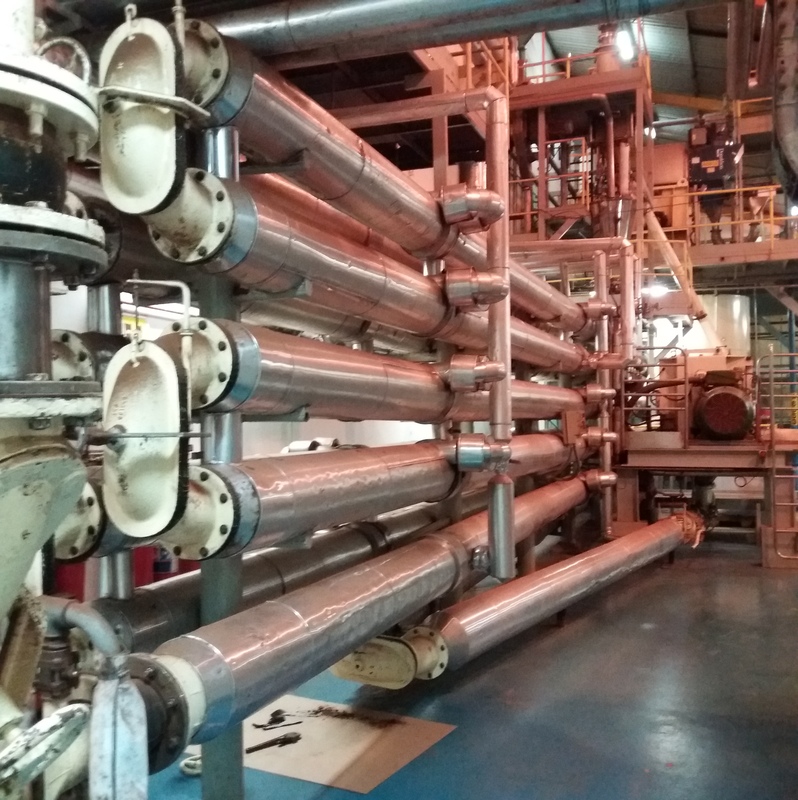 During the cooling process the powder is transferred through a carriage system resembling a radiator without the fins. 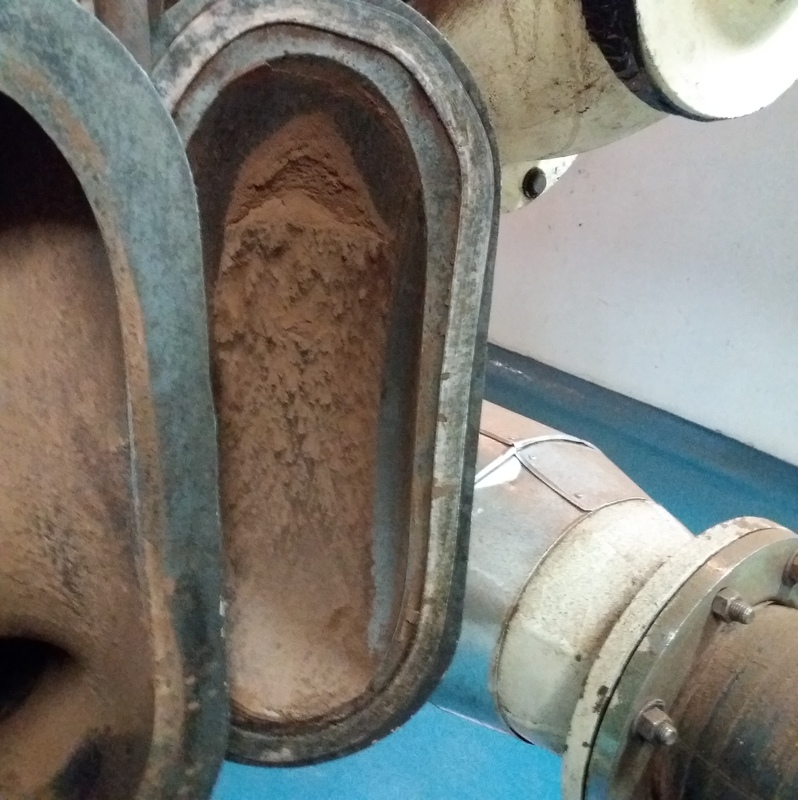 Inside the carriage system cocoa powder can accumulate in the 180° bends, and the build-up over time can stop material flow. So, these bends are serviced as part of a regular preventative maintenance program. The end user was looking for a way to extend the service interval length, hoping to find a solution to target the build-up areas in the 180° bends. The current setup requires manual cleaning every 15 days of operation. Modification of the existing setup is possible, provided it increases the time between maintenance procedures. 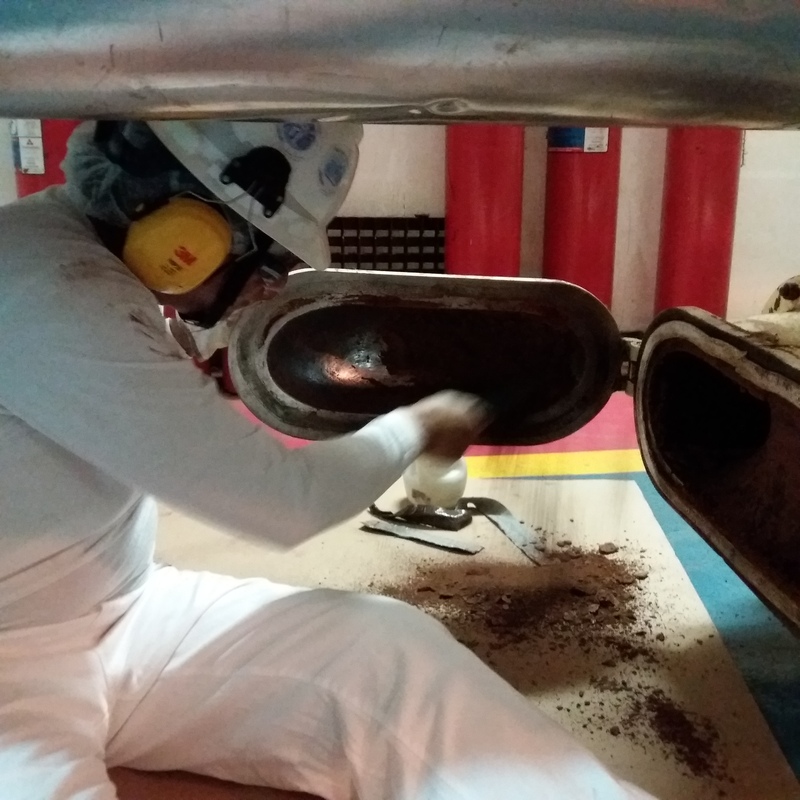 The solution we devised is a series of 316 stainless steel Super Air Nozzles, fed into the curves of the cooling carriage to prevent accumulation of the cocoa powder. The solution agitates any accumulating cocoa, removing the build-up and greatly extending the time between service intervals. This solution can be implemented in one of two ways; either through periodic entry of the nozzles into the cooling carriage (a somewhat difficult solution to implement), or through permanent installation with guarding in place to protect the nozzles (even powders can deteriorate a material with direct contact over time). 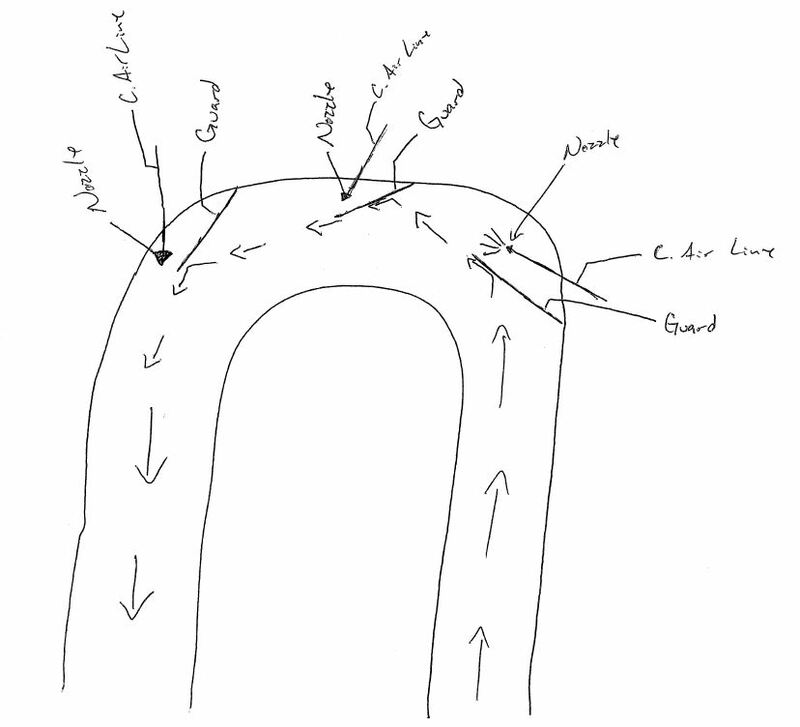 A (very) crude representation of the permanent installation is shown below. To install the nozzles into the curves of the cooling carriage, holes must be drilled into the curves. Sealed bulkhead fittings can be installed into the holes, and the necessary compressed air lines can be fed through the sealed bulkhead fittings. This will allow installation of the air nozzles in the needed locations. The final detail left to be sorted in this application was the exact model Super Air Nozzle to be used. The force requirement to dislodge the cocoa is highly specific and ultimately unknown, so we focused on a solution with what we deemed adequate force at an 80 PSIG operating pressure. 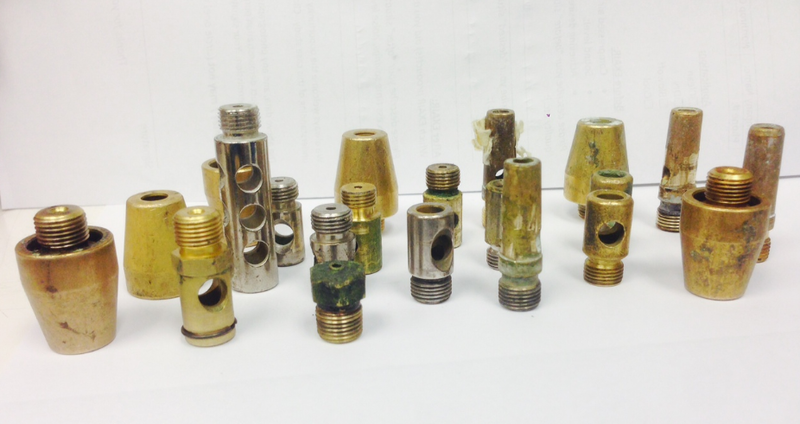 We chose a series of 1101SS Super Air Nozzles, remembering we can always reduce force and compressed air consumption through pressure regulation if needed. We were happy to help implement a solution to provide the needed results with the most efficient use of compressed air. 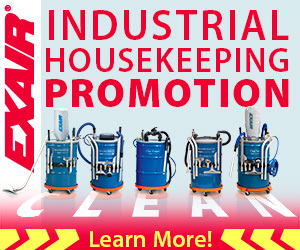 After all, that’s what we do at EXAIR. We help our customers find the most suitable, most efficient solutions for their applications. If you have an application and would like to discuss a compressed air-based solution, contact an EXAIR Application Engineer.